Rep. Duncan D. Hunter and his wife, Margaret, were indicted by a federal grand jury Tuesday for allegedly using more than $250,000 in campaign funds for personal expenses, including family vacations, dental bills, theater tickets and international travel for relatives. 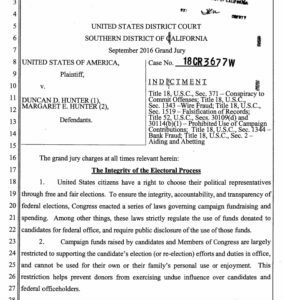 The indictment also accuses them of filing false campaign finance records with the Federal Election Commission. The couple allegedly misreported the expenses on FEC filings, using false descriptions such as “campaign travel,” “toy drives,” “dinner with volunteers/contributors” and “gift cards,” according to federal prosecutors. Duncan Hunter, 41, and Margaret Hunter, 43, are scheduled to be arraigned Thursday in downtown San Diego federal court. Hunter, a Republican, has represented east San Diego County in Congress since 2009, following in the footsteps of his father, Duncan Lee Hunter, who had represented the largely rural district since 1981. The younger Hunter was among the first House members to publicly endorse Donald Trump in his election campaign. Ammar Campa-Najjar, a Democrat who is challenging Hunter in the November general election, said the indictment reflects “the division, chaos and corruption” in national government. NBC7 reported that former Rep. Duncan L. Hunter said his son knew nothing of the alleged expenditures. Rather the congressman’s wife, Margaret, was in charge of the spending.The Hunters married in 1998. Throughout the indictment, the campaign treasurer, Chris Marston, is said to have warned the Hunters about their spending and in December 2010 threatened to resign. After that time, the Hunters lied to the treasurer about the nature of the expenditures, saying falsely that they were campaign related, the indictment states. For example, the indictment states that Mrs. Hunter spent $2,569.96 in campaign funds at Barnes & Noble, primarily to buy items for her family and friends. In order to conceal and disguise the illegal use of campaign funds for personal expenses, she falsely told the treasurer that the March 22, 2010, charge was for “booklets on San Diego,” it states. Noah Bookbinder, executive director of Citizens for Responsibility and Ethics in Washington (CREW) also called on Hunter to resign. 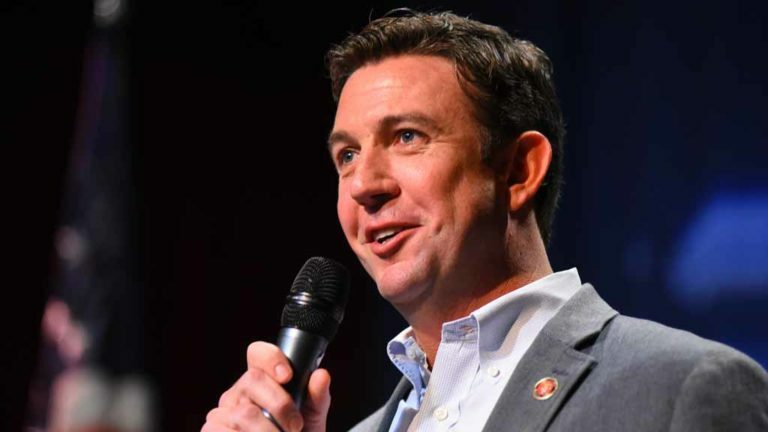 “Congressman Hunter and his wife have shown a blatant disregard for the law and for the people who contributed to his campaign, spending a quarter of a million dollars from his campaign for his personal benefit,” Bookbinder said in a statement. The Hunters maintained both a joint checking and joint savings account, but the indictment states that the congressman had a separate personal checking and savings accounts into which he made small monthly deposits for his own personal use. The indictment gives a look at the Hunters’ financial woes. Throughout the period of 2009-2016, they spent “substantially” more than they earned. They overdrew their bank account more than 1,100 times in a seven-year period resulting in $37,761 in “overdraft” and “insufficient funds” bank fees, the indictment said. With regard to their use of campaign funds for travel, the indictment states that Mrs. Hunter reserved hotels and paid other personal vacation expenses through Expedia, with the expectation that campaign records would not reveal the names or locations of their destinations. In addition, the document states that the Hunters concealed and disguised the personal nature of many of their campaign expenditures by attempting to have the campaign’s name taken off the official campaign credit cards. Travel expenditures with campaign money were documented in the indictment, including $14,000 for a family Thanksgiving vacation in Italy in November 2015; more than $6,500 for a family vacation to Hawaii in April 2015; more than $3,700 for a family vacation to Las Vegas and Boise in July 2015; more than $2,400 for a Las Vegas couples’ vacation in August 2011; and more vacations to destinations such as Lake Tahoe, Pittsburgh, London and Washington, D.C. In the entertainment category, it states that on 24 occasions between 2010 and 2016 Hunter spent $881 in campaign funds at Cottonwood Golf Club for greens fees, food, and drinks while golfing with family. Calling the charges against Hunter “deeply serious,” House Speaker Paul Ryan said Hunter will be removed from his committee assignments. “In our country, individuals are presumed innocent until a jury of their peers convict them,” he said in a statement. “Our founding fathers believed so strongly in freedom of religion that they gave us one amendment. They believed so strongly in the right to keep and bear arms that they gave us one amendment. — City News Service and Times of San Diego staff contributed to this report.